1 - NAVIGATE - Играй и знай! Паралелно събитие по проект Navigate в София, България - Игрови подходи за обучение по информационна грамотност за избягване на фалшиво съдържание. The Bulgarian Multiplier Event in Sofia. NAVIGATE - Information Literacy: A Game-based Learning Approach for Avoiding Fake Content. Ще се проведе в УниБИТ 2, бул "Шипченски проход" №69 А, LibLab, етаж 2. Покана и програма за събитието вижте тук! Placed at University of Gävle, at the University Library of Gävle. Date/Time 22th of February. Target groups is: Teachers, librarians, ICT-educators, IT-educators, school librarians, interested in based learning. Prerequisites: Free event. Lunch and coffee are included free of charge. If you are more than one participant outside of Gävleborg we will replace cost for the (via invoice) travel to/from Gävle for one (1) of the participants-if you are from the same organisation e.g. school/university. The participants will bring their own portable computers or tablets - for the workshop in the afternoon. Not all games are completely mobile. The program include a lecture on Gamification, with Jonas Klingström from the e-learning company Hariett AB. Lunch and networking. 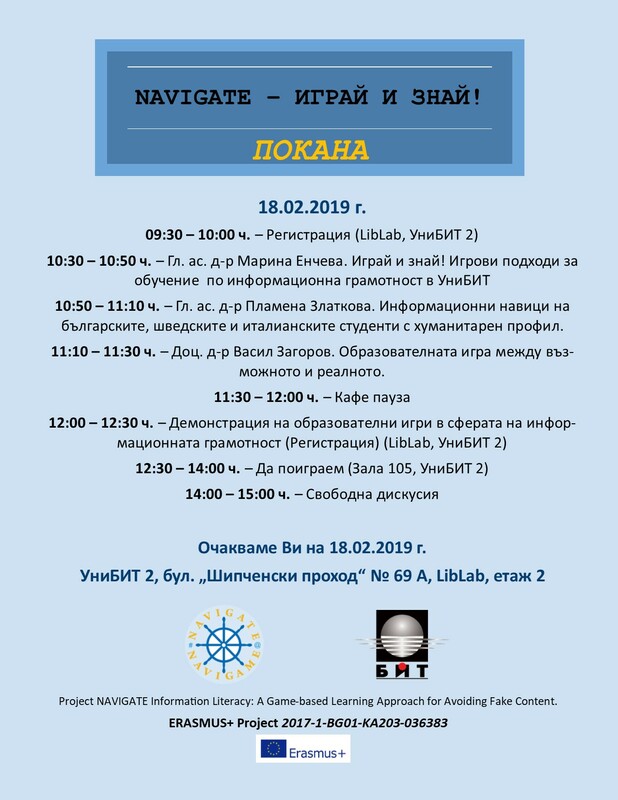 Presentation of the EU project: ERASMUS + Project NAVIGATE – Information Literacy: A Game-based Learning Approach for avoiding Fake Content. Workshop incl. Coffee, around information skills and try different games around information literacy and fake content. Information Literacy will be the focus of this event, designed mainly for the target group of librarians. What is Information Literacy and how it can be supported by libraries? With a mix of theory and practical activities we’ll try to unmask fake contents and fake news, supported also by existing online games. The ERASMUS NAVIGATE project originates from research results in the teaching and learning of Information Literacy (IL). The goal is to achieve the active involvement of students with the game, to improve learning through research, experimentation, competition and cooperation. The seminar at the Università di Parma aims to illustrate the first results obtained by the NAVIGATE Project, together with stimulating the debate on the gamification to learn information literacy. The Seminar is open to teachers, librarians, journalists, researchers and video games experts.